Everyday millions of people visit different websites in search of getting the best price, deals/discounts/coupons and cashback and end up spending a lot of time, money and efforts. 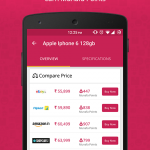 Compare Munafa is the first price comparison app for online shopping in India having features like price comparison, deals/discounts/coupons, price drop alert and cashback on every purchase in the form of Munafa points. Compare Munafa compares more than 250 trustworthy online stores including Flipkart, Snapdeal, Amazon, Paytm, Myntra, Shopclues, Homeshop 18 and much more to give you the best price. Thus, it saves time and money on all shopping. Shoppers can search products and find deals/coupons from categories like electronics (mobile phones, tablets, laptops, cameras, refrigerator, washing machine, T.V. etc. ), Home and Kitchen, books, flight tickets, travel, hotels , recharges, bill payments, fashion (men, women, kids) and books and media. Compare Munafa believes that only price comparison is not enough for effective online shopping and considering the vast competition between all online stores one need to provide online shopping offers and deals and it is one of the added feature in this best price comparison app. As a result, users are experiencing a lively profitable shopping. What does it provide special? Compare Munafa’s amazing features of price comparison, the best online deals- recharge cashback offers, Discount coupons and cashback (Munafa points) by using a single shopping apps make it perfect for online shoppers. You can shop from any store of your choice and receive cash back. In addition, you also receive interest on your cash back (Munafa points earned). We are continuously trying to make our mobile shopping apps handier and adding new features to enhance the shopping experience. It simply helps in knowing the lowest price for an item by comparing cost across 250+ stores. 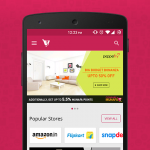 With the best result, users can get instant redirection to a store which is offering the lowest price for a searched product from sections like Electronics, Home & Kitchen, Men/Women Fashion, Book & Media and much more. Indeed, Buyers would be happy with this price checker app experience. For locating a product, buyers can instantly pick a category to which item belongs for example recharge, travel, food etc. Be it Amazon, Snapdeal, Paytm or Flipkart, users can select the store directly and make purchases and still earn Munafa Points which can be redeemed as Wallet Transfer, Bank Transfer, Bill Payments or Buy Vouchers etc. To refine result in a single go, this application has predestined quick filters in every section or category. It saves time that buyers usually waste in ordinary shopping process. 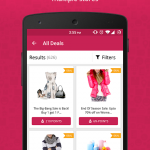 Compare Munafa is also known as deals app because it provides the best deals online and shopping coupons in India. It also provides a vast collection of the hottest discount offers with various parameters that help to sort the result as per the need. 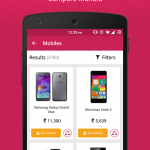 To make shopping profitable, cashback is the most effective term that is being featured by this cashback app. 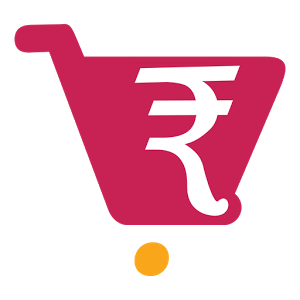 On every purchase of product, it offers Munafa points that is similar to cashback. Compare Munafa respect loyalty and if you collect 10,000 Munafa Points at the time of redemption its value grows to Rs. 10,500. This facility makes purchasing modernistic. If buyers are not satisfied with offered price then they can set price drop alert. When price of a selected item reaches, user will get notification. 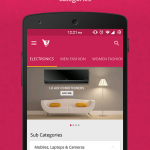 With this single android app, anyone can shop anytime and anywhere by just installing one of the amazing shopping apps in smartphone.